Angelo Vulpiani was born in Borgorose (Rieti) 08/08/1954, graduated from Rome University in 1977, the supervisor being Gianni Jona-Lasinio. He has been CNR Fellow (1978-1981), Assistant Professor at Rome University (1981-1988), Associate Professor at University of L’Aquila (1988-1991) and then at the University of Rome (1991-2000). 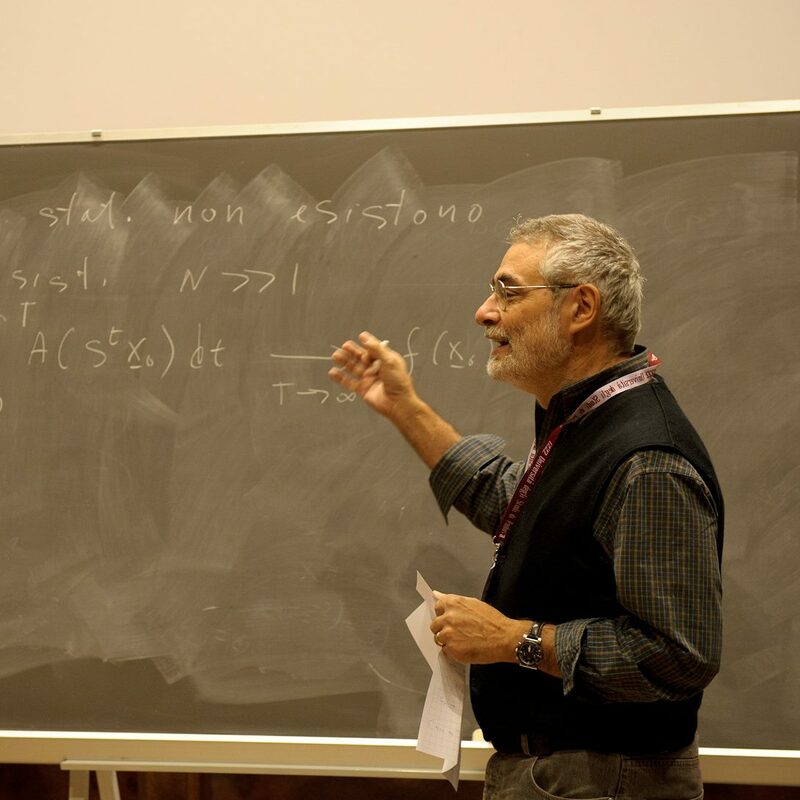 At the present he is Full Professor of Theoretical Physics at the Physics Department of the University of Rome ”Sapienza”, and is a Fellow of the Institute of Physics. He was a visiting fellow in several research institutes and universities in France, Belgium, Sweden, Denmark, and United States. His scientific interests include chaos and complexity in dynamical systems, statistical mechanics of non- equilibrium and disordered systems, developed turbulence, phenomena of transport and diffusion and foundations of physics. He has written about 250 scientific papers on international journals and nine books, including: T. Bohr, M.H. Jensen, G. Paladin and A. Vulpiani Dynamical Systems. Approach to Turbulence (Cambridge University Press, 1998); P. Castiglione, M. Falcioni, A. Lesne and A.Vulpiani Chaos and Coarse Graining in Statistical Physis (Cambridge University Press, 2008); S. Chibbaro, L. Rondoni and A. Vulpiani Reductionism, Emergence and Levels of Reality (Springer-Verlag, 2014). The claim that chaos is a severe limitation for the the possibility to make a prediction is part of the scientific folklore. The growth of infinitesimal perturbations is well characterized by the Lyapunov exponents. In many situations of interest, however, important phenomena involve finite amplitude perturbations, which are ruled by nonlinear dynamics out of tangent space, and thus cannot be captured by the standard Lyapunov exponents. In this talk I’ll review the application of the finite size Lyapunov exponent (FSLE) for the characterization of non- infinitesimal perturbations in a variety of systems. In particular, I’ll illustrate their usage in the context of predictability of systems with multiple spatio- temporal scales of geophysical relevance, in the characterization of nonlinear instabilities, and in some aspects of transport in fluid flows.